Your Security is a priority at Bonita Community Health Center. All e-payment transactions are securely processed through Authorize.Net. To learn more, click the Authorize.Net icon. Bonita Community Health Center offers the convienience of online bill payment using a credit card or debit card (Visa, MasterCard, Discover, and American Express). To Pay your bill, use the Account Number located in the stub area of your billing statement. The Account holder is the person that the billing statement is sent to. Please have your bill available when completeing this form. Payments will be applied to the oldest outstanding balance on the account entered above and will not be applied to any other billing account. 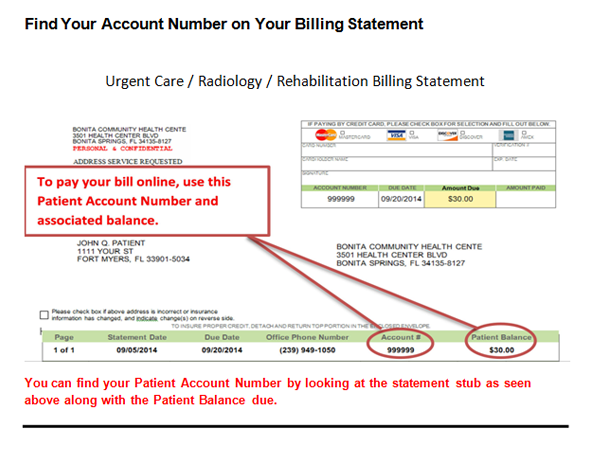 If you have any questions about your bill or would like to update your address and/or insurance information, please contact the Patient Billing at (239) 949-6152. If you need assistance finding your Patient Account Number see below for examples of statements and where to find information.